The proposed incinerator site at Ringaskiddy encloses on three sides the Hammond Lane Metal Recovery Facility. 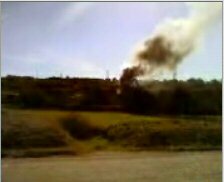 At the Planning and Licensing Oral Hearings, local residents pointed out that fires ignite regularly at this facility and that this poses an unacceptable risk in relation to the siting of the incinerators. 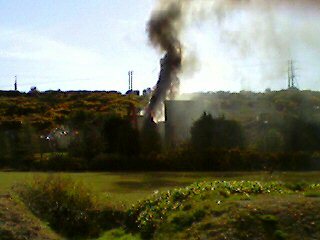 The photos below were taken on 11 April 2006 from the entrance to the National Maritime College - they record a fire at the Hammond Lane Facility, demonstrating just how inappropriate it is to build an incinerator next to this facility and directly across the road from the Maritime College.